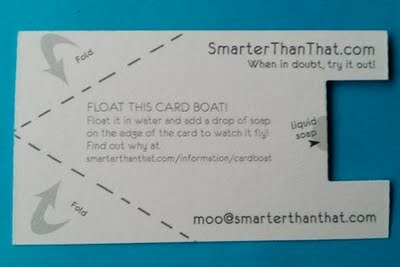 So you have one of my business cards, and you folded the dotted lines, floated it in water and added a drop of soap – and whoosh! watch it float away to the horizon. I’m glad you’ve enjoyed it! But why does this happen? As you probably noticed, the card has a notch cut into its back end. The notch creates surface tension in the water. Essentially, the water molecules bind together and “stick” to the edges of that notch. When you add a bit of soap, it breaks the molecular bonds and pushes the water backwards – like an engine! the little cardboard boat goes forward as a result, and you enjoy a fun demonstration of cardboat sailing. 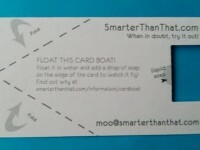 This could also work if you place the soap in the middle of the notch (in the water, as opposed to on the card itself), but the effect will subside as the boat moves away from the source of the soap. Try experimenting with the amount of soap and its’ location. It’s fun! When I was working for the American Physical Society this summer, they found my business card interesting — so interesting, in fact, that they made a post explaining the science behind it, with a video demo. Yay! Check it out, and read their article (and blog!) too, they rock. And while you’re at it, thank you for coming over to the site – I’m glad you enjoyed my little science demonstration. Now continue browsing the site for more fun, do-it-yourself home experiment that demonstrate scientific phenomena. Remember: When in doubt, try it out!